Baclofen Assisted Alcohol Withdrawal is another way baclofen can help the alcohol addicted patient. Alcohol withdrawal is very unpleasant and many patients are really scared by the prospect of having to go through it to get to sobriety. The first is to use the Ameisen regime, described in another section (link), where the patient starts on baclofen treatment while still drinking and reduces the alcohol intake as the cravings for alcohol diminish. This avoids withdrawal altogether. The other way is to stop drinking rapidly but use baclofen to make the withdrawal much more tolerable. A small dose of baclofen, just 10mg three times a day, given during the withdrawal period markedly reduces the severity and duration of withdrawal symptoms. It’s an easy addition to a standard alcohol withdrawal treatment with benzodiazepines like diazepam (Valium). A Baclofen Assisted Alcohol Withdrawal can be a starting point for longer term baclofen treatment. The patient will finish the withdrawal period at a dose of 10mg three times a day and can then start the Ameisen regime second part, the more rapid titration of the baclofen dose up until alcohol cravings are suppressed (link). My interest in Baclofen Assisted Withdrawal comes from working in an emergency department where we often have patients who present to us in acute alcohol withdrawal or who develop it when admitted to the hospital for treatment of other conditions. The study looked at 31 subjects who developed alcohol withdrawal syndrome (AWS) while hospital inpatients and they were closely followed for at least 3 days. They randomised the patients to receiving either baclofen 10mg three times a day or a placebo three times a day. The patients received otherwise standard care for alcohol withdrawal with benzodiazepine, in this case lorazepam which is widely used in the USA rather than diazepam (Valium) which is used in Australia for alcohol withdrawal. The effect of the baclofen compared to placebo was measured by how much lorazepam was required to control withdrawal symptoms in the two groups. They particularly looked at how many of each group required high dose lorazepam, which they defined as a total dose of 20mg or more over the first 3 days. For comparison, 1mg of lorazepam is approximately equivalent to 5mg diazepam so they were looking at patients who needed more than 100mg of diazepam for their withdrawal. *1mg of lorazepam is approximately equivalent to 5mg diazepam. In the placebo group, 7 out of 13 patients (55%) required more than 20mg of lorazepam. Three of them required high doses of between 21 and 49mg and 4 required very high doses of more than 50mg in total. The results in the baclofen treated group are dramatically different. They have much milder withdrawals – 95% of patients needed less than 20mg and only one required high dose lorazepam – 39mg in total. None needed very high dose lorazepam. The other data from this study which struck me was the difference between pattern of lorazepam requirement over the study time. FIG. 3. Cumulative lorazepam dose per 8-hour period (days 1 through 5). This graph shows the cumulative dose of lorazepam needed – a rising line means the patients continue to need more lorazepam and a flat line means that are not needing more. 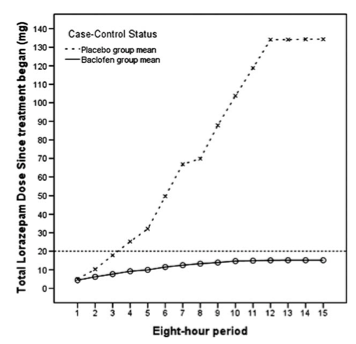 The placebo treated group needed to be given lorazepam doses for 4 days (rising line). Only on day 5 did this stop (flat line). This is the classic pattern for alcohol withdrawal. But the baclofen treated group was very different. They needed much smaller amounts of lorazepam to control their withdrawal symptoms and had pretty much stopped needing any further doses of lorazepam by the end of day 2. The dose of baclofen given in the study was small, only 10mg three times a day, and it didn’t cause any side effects in the patients. But this small dose of baclofen made a huge difference to the severity and duration of withdrawal symptoms. With this study in mind, I started to use baclofen 10mg three times daily as an addition to our usual Alcohol Withdrawal Scale (AWS) treatment protocol of diazepam given according to the AWS score. My patients showed the same pattern as the study patients. The first patients I treated were those who remained highly symptomatic from their withdrawal in spite of being treated with very high doses of diazepam, often over 100mg in just a few hours. We were struggling to get control of their withdrawal. In these patients, the addition of baclofen 10mg three times daily produced a rapid drop in their AWS scores and they rapidly turned into mild, short withdrawals. This led me to treat less severe patients with baclofen from the start of their alcohol withdrawal and I saw the same very beneficial effect. I generally added mirtazapine 30mg nocte to assist the patient to sleep, usually a major problem during alcohol withdrawal. Many of my patients had previously experienced alcohol withdrawal with diazepam alone so were well placed to compare it with new experience of a baclofen assisted withdrawal. They were very positive and described feeling “surprisingly well” with far fewer cravings. It was particularly noticeable to them on day 2 when they were normally at their worst. By day 3 they were generally ready for home, having stopped needing diazepam the day before. The overall requirement for diazepam was modest and short lived and the patients were not craving alcohol as they usually did during withdrawal or once the diazepam stopped. Like the patients in the study, my patients also had no side effects from the baclofen when started directly at 10mg three times daily. This rapid initiation of baclofen at is in contrast to the usual Ameisen regime where baclofen needs to be started very slowly to avoid side effects. Was it simply that these patients in acute alcohol withdrawal didn’t notice the side effects of baclofen amidst the unpleasant symptoms of withdrawal? No – these patients felt and looked really well. dose of baclofen was not sufficient, it was increased over the following weeks until there was good control of cravings. Essentially, a baclofen assisted withdrawal replaces the slow initiation phase of the classic Ameisen regime in getting the patient to a dose of 10mg three times daily. The next phase, the rapid upward titration phase is the same for both approaches. While a baclofen assisted withdrawal seems attractive because it’s faster initially, it’s not the better approach. Many patients will not reach their treatment dose of baclofen for weeks or even months after the baclofen assisted withdrawal. This can be a very difficult phase because they struggle to maintain control of cravings and drinking until then. However it can work for patients who are determined to quit and stop alcohol abruptly or who present in withdrawal and for others whose lives are in immediate danger if they drink again eg after a bout of pancreatitis. Some patients will be able to keep their alcohol intake under control until their cravings go but others will have repeated relapses until the baclofen dose is high enough to give them good control of cravings. For most patients, the classic Ameisen regime is preferred, especially in a general practice setting. The analogy of the hare and the tortoise is useful – the slower, steadier tortoise reaches the finishing line faster than the impatient hare. However this does not detract from the utility of baclofen assisted withdrawal in itself. The simple addition of baclofen makes alcohol withdrawal safer and shorter, whatever the plans for ongoing treatment are. In hospital –alcohol detox is not offered as an inpatient service per se but it often happens when alcohol dependent patients are admitted to hospital for a medical or surgical reason. This causes an abrupt cessation of alcohol intake followed by acute withdrawal. It makes sense to be using baclofen in these circumstances because the milder, shorter withdrawal will benefit patient and staff alike. This is a work in progress for me within the hospital system. In the Salvation Army Drug and Alcohol facilities: The Bridge Program. This should be more widely available over 2016 and beyond as the Salvos start to use baclofen at Bridge House and expand their services to provide medicalised detoxes. In General Practice- a Baclofen assisted alcohol withdrawal would be suitable for patients who could safely undergo a home detoxification. This could be done by a GP over a Monday to Thursday if there is a suitable support person at home. Home Detox Services: DAWN and ADIS. In these services, the GP prescribes the medications for withdrawal, which could include baclofen, and these services provide assistance to the patient. DAWN provides home visits and support during detox and ADIS provides phone support.